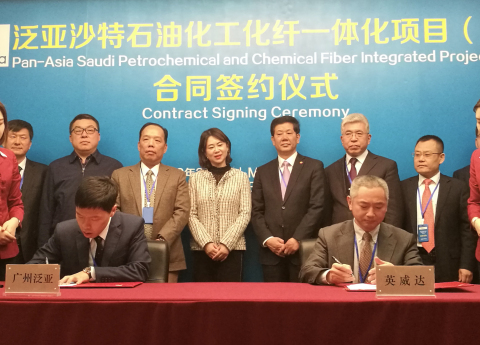 SHANGHAI--(BUSINESS WIRE)--INVISTA’s technology and licensing group, INVISTA Performance Technologies (IPT), and Pan-Asia PET Resin (Guangzhou) Co., Ltd have reached agreement for the licensing of INVISTA’s latest purified terephthalic acid (PTA) process technology. Pan-Asia will utilize INVISTA’s P8 PTA technology at a scale of 1.25 million metric tonnes per year. The plant would be built in Jizan Economic City, Saudi Arabia. This project signifies INVISTA’s first technology license in the Middle East. The targeted project start-up date would be in the first quarter of 2021. From the fibers in your carpet to the plastic in your automobiles, INVISTA’s commitment to continuous improvement has led its employees to develop some of the most durable, versatile polymers and fibers in the world. A subsidiary of Koch Industries since 2004, INVISTA brings to market the proprietary ingredients for nylon 6,6 and recognized brands including STAINMASTER®, CORDURA® and ANTRON®. As a key chemical enterprise of the Guangzhou Economic and Technological Development Zone, Pan-Asia PET Resin (Guangzhou) Co., Ltd. (“Pan-Asia”) produces 300,000 tons of PET chips each year, generating an annual output value of over CNY 3 billion. The company is among the largest PET chip producers in Guangdong Province and takes up a large share of the South-China PET chip market. Pan-Asia has established long-term partnership with major beverage producers from home and abroad, such as Coca Cola, Pepsi, Master Kong, Wahaha, Watson’s and Ganten. Pan-Asia is a wholly-owned subsidiary of Full Apex Group (“the Group”), which has a history of over thirty years. With a product portfolio ranging from bottle-grade PET chips, PET bottle preforms of various specifications, PET bottles to cartons, Full Apex is leading the food-grade plastic packaging industry in South China.